Herriman High track team showing that solidarity wins. The tone of her voice: introverted, soft, a twinge of meek plainness. But that’s where those adjectives end. Herriman High school athlete, Mikal “Mikie’ Brinkerhoff, 18, thinks life isn’t about the cards you’re dealt but how you choose to play them. I can easily imagine her light voice quoting Rocky Balboa, “You, me, or nobody is gonna hit as hard as life. But it ain’t how hard ya hit. It’s about how hard you can get hit and keep moving forward…” And Mikie has been hit hard by life. Only she is isn’t just moving forward, she’s running forward. “I always thought that her shoulder blades looked different, but I just attributed it to the fact that she was so petite,” Lynelle Brinkerhoff, who prefers to go by Lenny, said about her daughter. At 14, Mikie loved dance, tumbling, and had found a love for cheer: she was a natural athlete. By all accounts, her life ran parallel to the commonplace, until a routine physical revealed a curving nightmare that would test her will and that of her family. When the young girl was diagnosed with scoliosis (a spine abnormality), she had a 42-degree curvature of the spine (a lateral curve of the thoracic spine of 20 to 40 degrees is considered acceptable). By the end of that year, the number had reached 72-degrees, a figure so great that the spine began crushing a lung and compressing her heart. The problem required immediate and aggressive surgery. The Brinkerhoffs prepared the best they could for the very real chance that Mikie would never walk again. The doctor had given a grim, but honest, 50/50. 2 titanium rods and 17 screws (neck to pelvis) later, the family, along with the seasoned surgeon, watched as the 14 year old wiggled her toes. “It was a huge relief,” Lenny said, trying to hold back tears as she recounted the memory. But the tribulations and trying times for the Brinkerhoffs weren’t over. In fact, they had only just begun; the cross they had born all this way was about to get heavier. One day, two painful and uncomfortable months later, Mikie started complaining that she didn’t feel well. It wasn’t long after that that she suddenly fainted and collapsed in the family’s home. Her mother, frantic, rushed her to the doctor’s, fearing injury to her daughter’s back. But the cause of the loss of consciousness turned out to be something the Brinkeroffs had never heard of. After a tilt table test (a test in which a patient is positioned in a supine position and brought to a predetermined angle or angles from the horizontal position to help determine the cause of any decrease in oxygen to the brain) there was another diagnosis: POTS. Mikal Brinkerhoff’s X-ray, showing her spine at a 72-degree curvature. POTS is a syndrome, not a disease. Syndromes often have clusters of symptoms that are frequently seen together, but these seem to differ case by case, making the root cause difficult to pinpoint. “It was the worst day of our lives,” Lenny said, alluding to the fact that they thought the bad news had ended with the successful scoliosis surgery. They learned that one of the contributing factors of POTS is significant bodily trauma; the syndrome was attributed to the severity of Mikie’s operation. Mikal’s spine after a successful scoliosis surgery. A heaviness hung over the family as they tried to navigate the alien reality they suddenly found themselves in. “She had already gone through the scoliosis surgery. Endured the discomfort of a full-body cast, and now this. As a person I felt so bad for her. As a father, it was even worse. I wanted to take the pain away but wasn’t sure how,” Garland Brinkerhoff, Mikie’s father, said. In sever cases of POTS, quality of life is savagely attacked. “Mikie had it bad,” Mr. Brinkerhoff said. She began missing more and more school. Depression started infiltrating her space until it seemed to radiate from her core. Her social life was gone, and she was spending most of her time in bed, sleeping. Mikie’s best friend became hopelessness. Everything she previously hoped for and thought possible was now nothing but a painful dream. Lenny and Garland sat their daughter down and started to come up with a plan. At first, Mickie laughed, for obvious reasons, when her parents told her they thought that she should try running track. After her freshman year, Mikie Brinkerhoff decided she was going to make the varsity track team; nothing was going to stop her. Mikal Brinkerhoff warming up for a track meet. Not only did she accomplish that goal, she succeeded and excelled, making varsity her junior and senior years. Even today, despite an injury, she continues to work hard and compete at a top level. 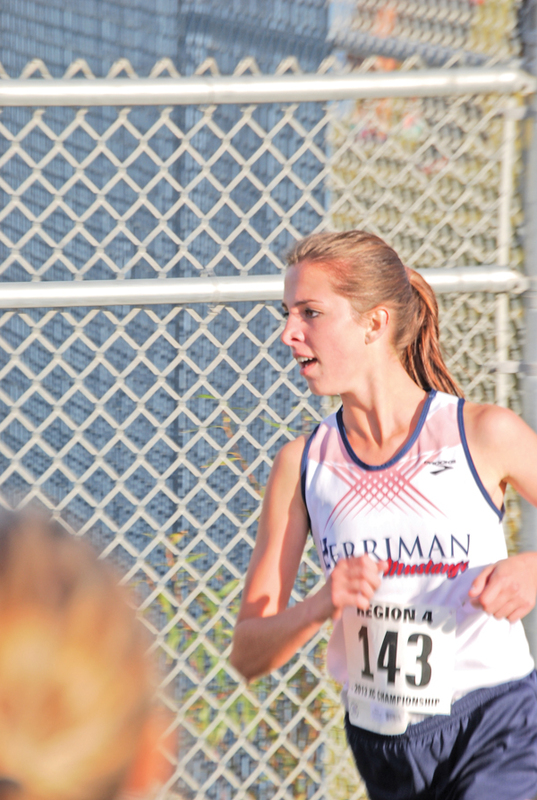 The Herriman High track team continues to push Mikie despite the hardships life has handed to her. “Trying to run, let alone run competitively, when you can’t walk or bend normally, is hard. It’s painful, but it’s all a life lesson. That’s the message I want to get out. Not only to those who are going through what I have gone through, but to everyone. Take what you get and learn from it and run with it,” Mikie said. Mikie Brinkerhoff is currently being looked at for possible track scholarships. She plans on earning a degree in sports psychology in order to help people overcome personal limitations. But first, she says she wants to serve an LDS mission. It is a message of hope, a lesson, even, in empathy for others and yourself, because even the wounds you can’t see are just as bad as the ones you can. Mikal “Mikie” Brinkerhoff’s story seems to be much more than a tale to learn from. It’s a story to live by.